I want to add Google Plus flavor to the code included in this Tutorial, however while signing in I get the following warning message from Log4J. and instead of redirecting to the registration form like it is for Facebook and Twitter flavors I get redirected once again to the login page. DEBUG - LoginController - Rendering login page. The code for the tutorial is available here. These are the changes that I've made to it. Spring Security 3.2.0, and a "normal" Spring MVC application. sign in by using a social media service. is passed as VM argument when Maven the Surefire plugin is executed. unit tests have been run. The rest of the changes are provided in the GitHub repository I have forked. the jetty.port can be of course omitted if you have the port 8080 free to be bound. Has anyone faced and solved this problem? With Twitter and Facebook it works without any problems. I have spotted that after a handshake with Facebook or Twitter I get redirected to /singup page if the account does not exist yet. However with Google Plus I get redirected to /signin which of course redirects to /login because there is no user account in the database yet. 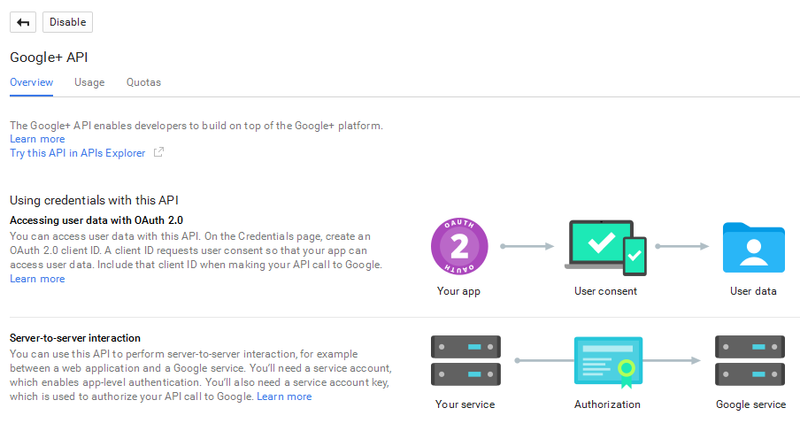 The problem was that the Google+ API was not enabled for my application in the Google Developers' Console. Why it is not enabled by default I have no idea. Also this project helped me a lot to diagnose the reason of the issue. "message": "Access Not Configured. The API (Google+ API) is not enabled for your project. Please use the Google Developers Console to update your configuration." Not the answer you're looking for? Browse other questions tagged spring spring-mvc spring-social google-plus-signin spring-social-google . How do you download a file with spring social google? social media feeds and json/xml data through api call?